With the recent speed events and interest showed a few of us who already speed ride talked about the possibility of doing some speed strip reviews with view to getting together for semi organised speed events. The rough idea is to have up to 6 locations reviewed on here and a list of interested riders willing to travel around the country at short notice when the wind, directions and tides connect for a certain location. Once there are enough locations and interested parties some form of format can be discussed and take it from there. 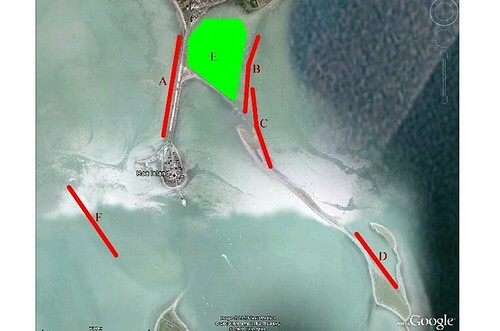 So I'll start the ball rolling with my spot "Roa Island" near Barrow in Furness, Take junction 36 off the M6. Tide state, 1 hour either side of high tide only. Tides of 8.5m and over. Positives, glassy conditions up to 10m from causeway, shallow up to 60m down wind. Negatives, occasional large rocks underwater, some rock pools, no set up area meaning a walk over the road after launching. Tide state, 1 hour either side of high tide, up to 9.2m the tide will stop at the edge of the marsh area. Positives, glassy conditions close to the marsh then small chop starts approx 20m from marsh, shallow water for approx 50m downwind. Negatives, bang offshore next stop Morecambe, 2 or 3 wooden poles hard to spot . Tide state, 1.5 hours either side of high tide, up to 9.2m the tide will stop at the edge of the marsh area. Positives, glassy conditions close to the marsh and land then small chop starts approx 20m from land, shallow water for approx 50m downwind. Negatives, 2 or 3 wooden poles hard to spot , stony underground alongside the stone wall causeway. wind directions for Starboard tack, not really suitable. Tide state, 2 hours either side of high tide. Positives, liquid ice conditions, land downwind for approx 200m. Negatives, nearly 3k ride out to get there, not allowed on to the land due to bird sanctuary. Tide state, Only fills in on 9.3m to 10m tides. The higher the tide the longer the session but max on a 10m is approx 1 hour either side of high tide. Positives, Mostly glassy close to the road then flat right across the marsh area. Soft under foot allowing shallow wipe outs without injury. Negatives, very small set up and launch area when tide is in so best to get there before high tide and stay in until it's going out. Will get busy because of the flat conditions and covering all wind directions for freestylers. Tide state, low to mid tide only. Not tried this area but it's well reputed with the windsurfers since the 80s as a speed bank, very muddy and down wind is into a shipping lane, to get there it's a slippy walk across mud and quite a hard tack up-wind across the channel.